Today Clemson Univ. is holding their commencement ceremonies where hundreds of Clemson students will join the Clemson alumni family...and on Friday the 13th no less! Earlier today we asked you on Facebook and on Twitter what kind of advice you would give a Clemson graduate. Here are some of your responses... humorous and smart. 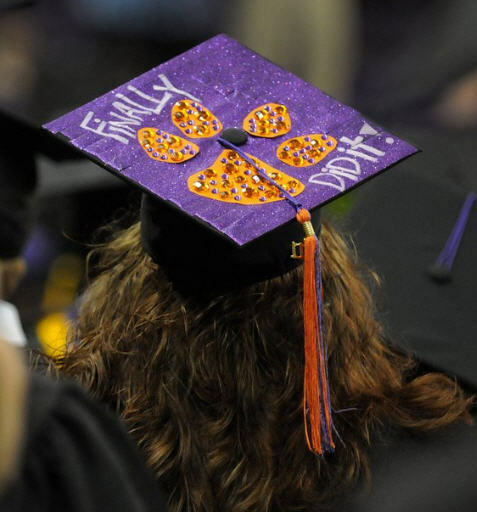 What advice would you give a Clemson graduate? 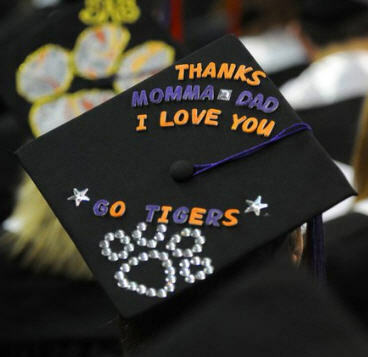 Or, if you could go back and have a conversation with yourself on YOUR graduation day from Clemson, what would you say? Post your responses in the comments. I also love when students get creative and decorate their hats. Here are two great ones from this morning's ceremony, posted on Clemson University's Facebook page. Congrats to all of today's Clemson Univ. graduates! Welcome to the Clemson alumni family -- don't forget to turn your class rings upside down!